Leaders of the Social Work Community Outreach Service (SWCOS) of the School of Social Work (SSW) joined other community partners and University of Maryland, Baltimore (UMB) volunteers to open a much-needed place for kids to play. The activities of Sept. 15 marked the building of a new playground at a West Baltimore school, whose students awaited final completion until Sept. 22. On that day, four classes of pre-K and kindergarten children became the first to experience the thrill of playing on the new equipment. Nearly 200 volunteers over a span of six hours helped to complete the playground at the Harlem Park Elementary/Middle School. The new play space features 18 play structures spread across 2,500 square feet of what was once a vacant, sandy lot. Children had to wait for installation of a protective surface before taking their first trips on a triple-slide or rock-climbing ladder. 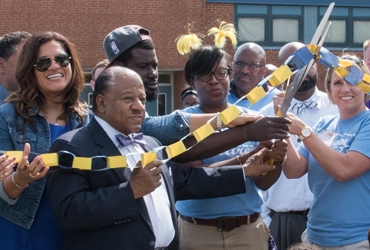 Baltimore City Councilman William “Pete” Welch joins volunteers and Harlem Park Principal Denisha Logan in a ribbon-cutting ceremony. The pre-K to eighth-grade public school serves nearly 400 students in the Harlem Park/Sandtown-Winchester neighborhood, and is among the Community Schools overseen by SWCOS. In a lengthy planning process, students were given input. “The kids drew what they wanted, and put all their thoughts together,” said Community Schools coordinator Danielle Harris, LCSW-C.
“It’s a brain expander, friend maker, and muscle builder,” said Jackson. Partners participating in the build included the CarMax Foundation, teachers, staff, and parents from Harlem Park Elementary/Middle School, Play More B’More, The Family League of Baltimore, and Baltimore City Public Schools. Wendy Shaia, EdD, MSW, executive director of SWCOS, Becky Davis, MSW, director of organizational sustainability at SWCOS, and Karen Powell, assistant director for the Positive Schools Center, attended the build. “In a community where you have a lot of dilapidated buildings, school needs to be a safe haven, a healthy environment in which to grow. The playground gives kids that,” said Powell. Harlem Park Elementary special education teacher Ginny Millard wrote on a gofundme.com site seeking donations for the project, “It is well-documented that play not only promotes physical activity, reducing obesity and related health problems, but also improves cognitive functioning and academic performance significantly.” The school applied for and received a grant from KaBoom! The CarMax Foundation provided the majority of funding. Community donors raised nearly $9,000. “The beauty and the spirit of our children is the only thing more beautiful than this playground out here today,” Millard said at the ceremony just before participants cut a ribbon made of colored construction paper links. The new play space also includes an outdoor classroom area and small stage. Logan and Jonathon Rondeau, Family League president and chief executive officer, also thanked the community for its support. School of Nursing (SON) assistant professor Marik Moen, MPH, MSN, RN, led a team of several nursing students who were working up a sweat in the bright sun as they helped to build tables, benches, bean bag toss games, and concrete foundations. The SSW also recruited volunteers from the school and the University. SON student Kattrina Merlo was busy smoothing out rough edges of a wooden bench with sandpaper. “It’s important to do things like this to help out where you can,” she said.